The Eterna 6 watt T4 fluorescent 3400k white tube, 12 mm diameter with 232 mm including pins and 220 mm excluding pins is specifically designed for use with Eterna brand fittings. Please note fluorescent tubes do not come in standardized lengths so please make sure your tube is the same. Suitable for use with electronic ballast. 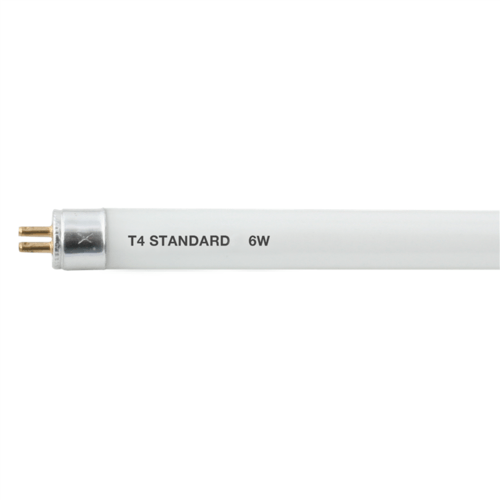 The T4 G5 fluorescent tube offers longer life, improved energy rating and high quality life. Can be used for under cupboard light fittings, pelmet or emergency lighting. You may also be interested in the 10w version of this bulb.